That’s how a job advertisement begins for the Los Angeles ad agency 360i. 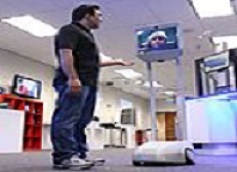 The internship encourages applicants to live wherever they want and work at 360i LA remotely through their “fancy telepresence robot”. In particular, 360i is on the lookout for candidates who are keen to learn about new technologies, social media and advertising. And in 2016, learning how to work via teleconference is becoming an increasingly valuable skill to have. The intern will be required to work via beam robot for five hours a week for four weeks. However, this is a flexible schedule with a start date to be determined. They will also learn to work on real client briefs and special assignments. Not to mention, attend meetings and present work from within the four-foot-tall robot. All the while, the intern is expected to document his/her experience on the robot’s Snapchat channel. Michael Nuzzo, group creative director of 360i L.A., said the company is very excited to provide an opportunity to someone who would otherwise be unable to make the travel arrangements. “There's a lot of great, untapped talent out there and not just in the New York and L.A.'s of the world,” he was quoted as saying by Adweek. The company also advises applicants to include a link to some examples of their digital/social creativity. Moreover, the finalists will be interviewed by beaming in to the agency in LA. Lawyers trained to "polish up their human skills"